Majura kangaroo killings: Another Belconnen Cover-Up? In May 2008 a total of 514 healthy kangaroos were exterminated on the former Belconnen Naval Transmission Station by the Department of Defence. RSPCA-ACT chief Michael Linke insisted that the kangaroos were ‘starving’ even though eye-witness accounts and photographic evidence showed no starving kangaroos. They do after all, eat dry wild grasses, and have been doing so for the last 40 million years. According to Dr Maxine Cooper, Environment Commissioner, the kangaroos at Belconnen were a threat to certain vulnerable and endangered species of fauna and flora on the site (Ginninderra Peppercress, Striped Legless Lizard and Golden Sun Moth), even though the EPBC Act lists threats other than kangaroos (such as weeds, feral animals, domestic dogs and cats, land clearing, agriculture, slashing, inappropriate burning, livestock, rabbits, rock removal and vehicles). Yet cows were grazing in the adjacent paddock, apparently not a threat to the species listed (as if moths and lizards recognise fences!). So if both excuses of starvation and threat to endangered species were untrue, what was the real reason for the Belconnen massacre last May? In The Canberra Times dated 18th March, 2008 an article titled Roo Cull Land Contaminated raised the issue of soil contamination in relation to part of Belconnen being released by Defence for housing. Soil remediation would be necessary. Then again on 27th September, 2008 The Canberra Times printed another article, by Rosslyn Beeby, titled Revealed: Toxic Waste Dump which showed serious lead, heavy metals, asbestos, carcinogenic dioxin and PCB contamination in the soil and groundwater, even down to Lake Ginninderra. The scandal was that ACT government wanted to build housing on contaminated land. As if remediation could possibly clean it up! for public information at community consultations and ministerial briefings about the clean-up. The ACT has previously denied it plans to develop the land for low-cost housing. But ACT Planning Authority documents obtained by The Canberra Times indicate the Government has at some stage considered the site in plans to expand the suburb of Lawson. The Defence reports recommend excavating 6000 cubic metres in some areas, to a depth of at least 6m from a former rubbish dump at the site, as well as removing 900 sq/m of topsoil from grassland where federally- protected plant and insect species occur. Just where are they going to put this toxic soil? Local groundwater is contaminated by polychlorinated biphenyls (PCBs), toxins that accumulate in the environment and have been linked to cancer, liver damage and immune and reproductive disorders. Petroleum hydrocarbons are leaking into soils and groundwater from disused underground fuel tanks that still ''contain product'' in several areas. Does Defence think that local residents won’t connect the dots? if Defence had approved the proposal to move the kangaroos instead of killing them, health checks on the kangaroos would have revealed pollutants. In the past, blind sheep have been found grazing at Belconnen. There is a shortage of land in Canberra to develop housing and commercial estates. Developers are leaning on Defence to release more land, as at Belconnen. Could Majura be next? And is Majura Training Area contaminated too? We do know that the 514 contaminated Belconnen kangaroos were buried at Majura in a large pit. I can't help but wonder if Defence could be moving the toxic Belconnen soil to Majura. The Hon. Mike Kelly, Secretary for Defence is gearing up to kill aproximately 6,000 kangaroos on Majura Training Area, which is 8,000 acres. Nobody really knows how many kangaroos there are but the estimate is less than two kangaroos per acre (hardly excessive) yet Kelly claims that the kangaroos are starving and degrading the rare grasslands. Where is the scientific evidence of starvation or degradation of grasses? There isn’t any, as with Belconnen. Across the fence, a hobby sheep farm illustrates accepted ACT land management practices. This land is now a dust bowl (see picture next). Yet the kangaroos at Majura are blamed for degrading rare grasslands. Which looks like it could support life and threatened grassland? Certainly not the clapped- out sheep farm. Furthermore, according to locals, there is a plague of rabbits at Majura. Why is Defence more worried about kangaroos than rabbits who do far more damage to grasslands? How ironic that our national icon is blamed for damage to the environment actually created by humans, especially when you consider that kangaroos benefit the land in many ways. They eat dry grass that livestock won’t eat, grass that ignites easily in bush fires. By eating native grasses (that livestock don’t eat) they regenerate the grasses, helping many other species to survive. Their long claws aerate the soil allowing soil ecosystems to thrive, whereas livestock compact the soil and cause deserts. 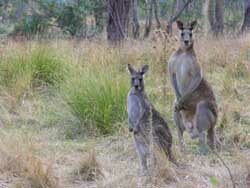 The more kangaroos, the healthier the ecosystem! The D.O.D. plans to turn Majura into an internationally-significant night manoeuvres firing range. But they could never justify killing thousands of protected native animals to upgrade their night training. While high-tech night responsive equipment may be sensitive to night ground movement from kangaroos, they could use ultrasonic devices such as Roo Guard (endorsed by the Qld. Grain Growers’ Association) to keep them away from those areas and create corridors to surrounding acres with water and proper fencing. Why does the government protect special interests (i.e. developers) but make no effort to protect native Australian land or animals? Kangaroos are not the problem. Human activity and livestock grazing are. The government may not care about kangaroos, but many people around the world do. As people learn about what is becoming known as Australia's Dirty Secret, they're not only outraged, but are choosing not to visit Australia and spend their tourism dollars. See also: "Majura demonstration in Canberra" on www.canadianvoiceforanimals.org, "Another Slaughter of kangaroos planned" of 14 Apr 09 on Quaker Concern for Animals web site. [Appreciate the alert Menkit - sounds like it's all about inconvenience to Duntroon's Army officer field training on country acquired at Majura]. ACT Commissioner for Sustainability and the Environment, Dr Maxine Cooper, is ACT's inaugural full-time Commissioner in the role, yet what relevant environmental qualifications and experience does the incumbent have, or indeed lack, to be officially condemning another local indigenous popluation of Australia's iconic marsupials, our kangaroos, to slaughter for cat and dog food? The Environment Commissioner's own website lists her formal qualifications in the areas of Environmental Planning, Environmental Design and Environmental Science. All these 'environmentally' friendly prefixes sound impressive, until one realises that each of these areas of academic study are not fauna focused, but indeed all about human-centric utilisation of the natural environment for the benefit of humans. That is, these qualifications are all about maximising the convenience of the environment for humans. A wolf in charge? Such qualifications offer no insight into the surival and habitat needs of Australian wildlife. "According to ACT's inaugural Environment Commissioner, kangaroos at Belconnen were a threat to certain vulnerable and endangered species of fauna and flora on the site. Where's the bloody independent zoological evidence, who would attest to this view under the test of peer scrutiny? Now if our roo-shooting redneck commissioner had a more relevant Bachelor of Science in Zoology from say the University of Melbourne, she may be of a contrary mindest, less aligned to human planning needs and monetary gains more empathetic to ecological needs of nativa fauna. "How animals live and why they live that way are questions addressed by zoologists. Most of the Australian fauna are poorly understood or not even formally named, yet informed management and resource use of Australia's flora, fauna and habitats depend upon zoological knowledge. We need to catalogue what species exist and how they survive in their natural environments. This requires knowledge of their physiology, breeding and reproductive systems, ecology, evolution and behaviour." Maxine Cooper, where are your qualifications in zoology and in the conservation and Australian wildlife to entitle you to officially condemn thousands of Australia's iconic kangaroos to slaughter for dog and cat food? Can you guarantee the Australian public that none of these kangaroos is to be minced for dog and cat food? The standard setting for the job prerequisites for the ACT's Environment Commissioner are woeful and clearly not in the best interests of the target subject - our natural wildlife. What were they thinking by employing a planner in environmental management? Obviously, when they employed a planner in environmental management, they were looking for someone to promote overpopulation, overdevelopment and a love of concrete on behalf of Australia's Growth Lobby. There are people like this in every state now. Australia is going to the dogs... wolves... um ... the hairless apes. Apologies to wolves. 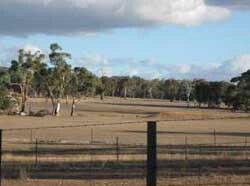 Why not manage weeds, over-grazing and rabbits? The ACT Commissioner for Sustainability and the Environment, Dr Maxine Cooper, in her Report on ACT Lowland Native Grasslands states that only 5% (1,000 hectares) of the estimated 20,000 hectares of Natural Temperate Grassland that existed in the ACT prior to European settlement remains. Her report identifies that there is an "urgent need for land management actions to be undertaken to protect the 60% of the Territory’s lowland native grassland sites”. She identifies the threatening processes to include weeds, inappropriate mowing regimes, overgrazing by stock, Eastern Grey Kangaroos and rabbits. However, without qualifications, she concludes that it was the "over abundance of kangaroos is a recent and highly significant threat" and that they are "likely to adversely affect other sites in the future". It is well known that kangaroos are frugal in the amounts of water and grasses consumed, and they padded feet are soft on the soils. Surely, the more obvious and more robust impacts to manage would be the weeds, overgrazing by livestock and rabbits? Maxine Cooper's agenda, it appears, is to rationalise what Defence and ACT leaders really want, the massacre of kangaroos, and find the "science" to justify it!